Crazy Love is publishing the new Grave Stompers CD "Black Leather Ghouls from Fiendsville". 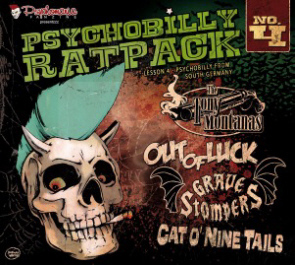 The Grave Stompers published three songs on the Psychobilly Ratpack 4" sampler. At the moment they working on new song material for the next CD. This 7" is exclusively produced by the Grave Stompers! Orders can be made here! After returning from the incredible trip to St. Petersburg the band immediately continued the recordings of the upcoming album entitled "SPOOKED, CURSED & HAUNTED!" as well as the studio work on the 13th anniversary 7"!! The seven inch contains new recordings of following tracks: "Midnight SickSickSix", "I am the Necromancer", "Halloween in Haddonfield" plus one track taken from the upcoming album in an extended version. Now that the summer heat has disappeared and the days are getting shorter the Stompers got into the right mood to start the recording sessions for the upcoming full length album and the anniversary 7”. Exactly on October the 31st under a cold autumn moon the guys entered the Funeral Lounge Soundcave to take hands on their sinister conspiracy... Unfortunately the studio work had then to be interrupted for a wile because of healthy difficulties – the release date of both outputs is now dated in 2007. The Grave Stompers are preparing new stuff for an upcoming full length album released on Crazy Love Records; the official album title isn't announced yet. The recording sessions will start in early summer 2006 at the Funeral Lounge Soundcave. Here's a list of songtitles, which will definitely find their way on the new release: Faster than hell, Jumping the batcaverock, Riot at the club, Bone sweet bone, Call from the grave (pt. II), The spook, She's a vamp... You can expect an album packed with raging, stomping, vintage-fashioned psychobilly - once again the Grave Stompers bring forth their own sinister world of gloom, ghoulish women, psycho frenzy and savage rock'n'roll! Look out! In memory of Nico - R.I.P.